Eoin Murchan and John Small are both set to start against Tyrone. DUBLIN HAVE NAMED an unchanged side for tomorrow’s All-Ireland football final against Tyrone (throw-in 3.30pm). 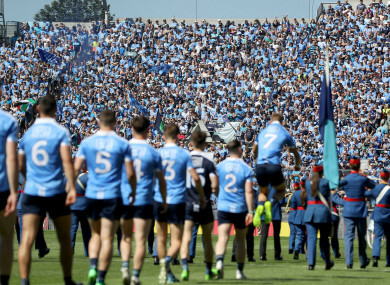 Jim Gavin is set to stick with the same team that beat Galway by nine points earlier this month with Cian O’Sullivan fit to start following the injury scare which forced him off in the first half of the semi-final. Eoin Murchan and John Small, both of whom were late inclusions against Galway, retain their starting places while Ciaran Kilkenny — who has scored 2-21 from play this summer — is named at full-forward. Tyrone named their side on Thursday night, with Mark Bradley set to start at corner-forward in place of Lee Brennan. Email “Dubs name unchanged side for All-Ireland decider against Tyrone”. Feedback on “Dubs name unchanged side for All-Ireland decider against Tyrone”.